This egg was last seen in public over 112 years ago, when it was shown in the Von Dervis Mansion exhibition of the Russian Imperial Family's Fabergé collection in St. Petersburg in March 1902. In the turmoil of the Russian revolution the Bolsheviks confiscated the Egg from the Empress. It was last recorded in Moscow in 1922 when the Soviets decided to sell it as part of their policy of turning ‘Treasures into Tractors’. Its fate after this point was unknown and it is was feared it could have been melted for its gold and lost forever. 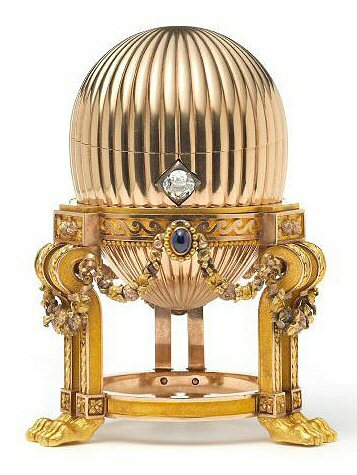 It was only in 2011 that Fabergé researchers discovered that the Third Imperial Egg survived the revolution, when it was discovered in an old Parke-Bernet catalogue. 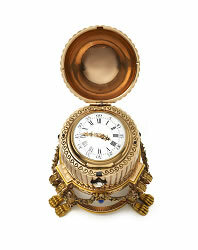 Its provenance had been unknown and so it was sold at auction on Madison Avenue, New York on 7th March 1964 as a 'Gold watch in egg form case' for $2,450 (£875 at the time). This discovery started a worldwide race to discover the whereabouts of the egg, which was now worth tens of millions of dollars. In the meantime the egg was bought in the Mid-West of America at a bric-a-brac market. The buyer lived a modest live and tried to make extra money by buying gold and selling it for its scrap metal value. When he spotted the egg, he thought he could make an easy $500, although they had to pay $14,000 for its scrap metal value. But what had worked on many occasions, did not work this time. He had overestimated its worth and couldn’t sell it. No one spotted its potential and luckily no one offered more than the owner had paid for it, hence it was saved from the melting pot. The egg has several scratches on it where the metal was tested for its gold content. The egg became a financial burden to its unknowing owner. One evening in despair the owner tapped 'Egg' and 'Vacheron Constantin' into Google and a Telegraph article regarding the egg's survival appeared quoting Kieran McCarthy, director of Wartski, the London based, Royal Warrant holding experts on the work of Carl Fabergé. Recognising his egg in the article the owner was unable to sleep for days. He got on a plane to London to find Kieran and to show him images of the egg. Kieran was left speechless by the images and was almost certain the lost egg had been found, but to confirm its identity and ensure it was not a very clever fake, he travelled to the US. When he arrived in a small town in the Mid-West, he was shown into the kitchen of the owner’s home and presented with the egg, which was slightly smaller than the large cupcake positioned next to it. After an examination he confirmed that it was indeed the lost Imperial treasure. It had travelled from the hands of an Empress in the grandeur of Imperial St. Petersburg to a scrap metal dealer in modern day America. Wartski acquired the egg for a private collector, making the finder an art historical lottery winner, receiving multiple millions of dollars per centimetre of egg. The collector has generously allowed the egg to be displayed in London where it will be on view for only four days in a specially designed exhibition at Wartski. 2007 In “Two Lost Fabergé Imperial Eggs Discovered in an Archival Photograph” (Fabergé Research Newsletter, Eggs – November 2007), two missing Eggs are identified as the 1888 Cherub with Chariot Egg and the 1889 Nécessaire Egg (later identified as the Third Imperial Egg). November 2008 - Revision of the "Egg Timeline" and discovery of a "new missing Fabergé Egg". 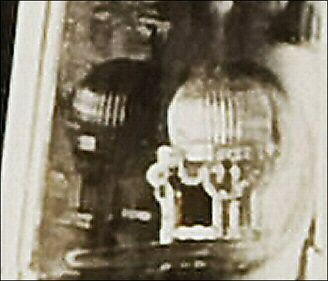 July 2011 - Discovery of a photo of the "new missing Fabergé Egg" in an auction catalog dated 1964. August 2011 - Publication of the photo and research story in Britain's The Telegraph. 2013 - January 2014 - Wartski buys Egg from man in Mid West USA. March 18, 2014 - Press release about the discovery of this Egg and the four days it will be exhibited in London April next. Washington Post - Scrap dealer’s bargain turns out to be Faberge egg ... Independent Faberge expert Geza von Habsburg said the egg is “absolutely genuine” and matches the one-line description found in records kept by Russia’s Imperial Cabinet. For those of you who like the longer research version, see below! 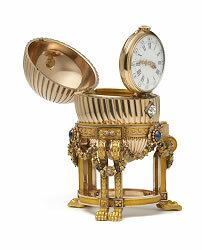 For a very long time it was thought that the Blue Serpent Clock Egg was the 1887 Egg. Recent discoveries however prove that the Blue Serpent Clock Egg is the 1895 Egg  and the 1887 third Fabergé Imperial Easter Egg is a "new and missing" Egg. Read about how the object illustrated below could be the missing Egg: here. Von Habsburg, Geza, in, Fabergé Revealed 2011, p. 29, note 62. A fine image as well as a detailed written description of the missing 1887 Egg has been discovered by Anna and Vincent Palmade on the 6th of July 2011 as lot 259 in the catalog for the Parke Bernet auction which took place on the 6th and 7th of March 1964. This new discovery further confirms the theory that the Blue Serpent Clock Egg is not the 1887 Egg but the 1895 Egg. The picture in the auction catalog matches perfectly with the photograph from the Von Dervis 1902 Fabergé exhibition (see the two images side by side below). There are four reasons which, when put together, show that the egg pictured as lot 259 in the 6 & 7 of March 1964 Parke Bernet auction catalog is the missing 1887 Fabergé Imperial Egg. First, a careful comparison of the egg pictured in the auction catalog with the one pictured in the vitrine of eggs belonging to Maria Feodorovna from the 1902 Exhibition clearly shows the two eggs are one and the same. Thus, the key question (first asked by Kieran McCarthy of Wartski) is whether all the eggs in this vitrine are from Fabergé. A first strong clue this is indeed the case, is the fact that all the other (eleven) eggs which are visible in the vitrine are from Fabergé - the same is true of all the seven eggs which are all clearly visible in the closeby vitrine belonging to Alexandra Feodorovna. Furthermore, the other non-egg pieces in these two vitrines are either well known Fabergé pieces or are looking very much like Fabergé pieces from a stylistic point of view. A second clue is the title of this Exhibition was "Fabergé artifacts, antique miniatures and snuffboxes" (see Fabergé, Proler, Skurlov 1997 p52) which suggests the objects which are not miniatures or snuffboxes are from Fabergé. A third and final clue stems from the fact that the miniatures and snuffboxes seem to be in their own vitrines. 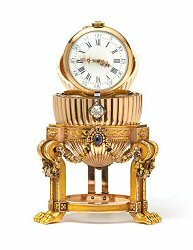 Second, this egg fits the description for the 1887 Fabergé Imperial egg in the account books of N. Petrov (Assistant Manager to the Imperial Cabinet): "Easter egg with clock (the Russian word for clock and watch is the same), decorated with diamonds, sapphires and rose-cut diamonds". The egg also fits the description of an egg in the 1922 Soviet inventory - that later description even specifies 3 sapphires, a diamond pushpiece and a gold pedestal - the egg illustrated in the auction catalog has all of that. The 1922 inventory does not specify whether this egg is Fabergé, but it is the egg in the inventory whose description is by far the most consistent with the one in the account books of N. Petrov which we know is Fabergé (see Appendix 4 in Fabergé, Proler, Skurlov 1997). 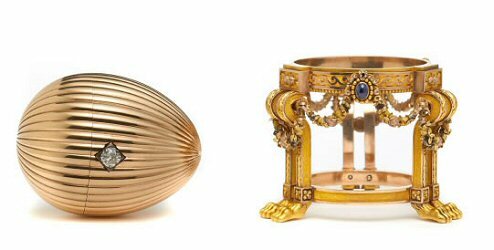 Third, the style of the egg is very consistent with the Fabergé style around 1887. The reeded gold egg is typical of Kollin and the three color gold swags of roses and leaves on the pedestal is typical of Perkhin, consistent with the piece being from the transition of Head Workmasters which happened in 1886/1887. Finally and fourth, and this is really interesting/fortunate, Annemiek Wintraecken has independently (back in October 2008) freed up the 1887 slot in the Fabergé Imperial Egg chronology (see). Annemiek showed that the Blue Serpent Egg is likely to be the 1895 egg and not the 1887 egg (e.g. it does not have any sapphires, the style is too elaborate for an early Fabergé egg and, as first argued by Lopato, the 1887 price seems too low). 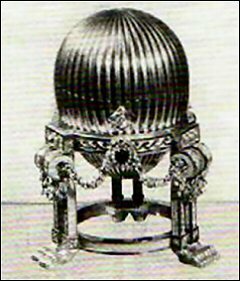 It should also be noted the written Russian description talks about an "egg with clock" for the 1887 egg while it would talk about a "clock-egg" or a "clock in the shape of an egg" for the eggs in the style of the Blue Serpent Egg. Annemiek also shows that the Twelve Monogram Egg fits the 1896 slot better than the 1895 - leaving the 1895 slot for the Blue Serpent Egg (1895 is the only slot the Blue Serpent Egg could fit). Annemiek's discovery of a new timeline was critical because 1887 is the only slot the egg from the auction catalog could aspire to. In effect, it does not fit at all the written descriptions of the missing 1886 (Hen Egg with Sapphire Pendant) and 1897 (mauve enamel) Eggs. Nor could it occupy the 1889 or 1888 slots which are no longer vacant following Kieran McCarthy's discovery in an old Wartski photograph of the 1889 Nécessaire Egg in March 2008 (see) and our discovery, two shelves below in the same 1902 vitrine, of the 1888 Cherub with Chariot Egg in November 2007 (see). Finally, because the 1902 Exhibition took place on the 15th of March before Easter, it cannot be the missing 1902 Empire Nephrite Egg. This is thus a case of two independent discoveries reinforcing each other! In conclusion and because of the four reasons discussed above, the egg from the auction catalog has to be the third Fabergé Imperial Egg for Easter 1887. It had not been recognized until now because it seems to bear no marks (like the first Fabergé Imperial Egg) and because it has a Vacheron Constantin watch as the surprise... which is surprising for a Fabergé Egg. As suggested by Kieran McCarthy, this surprise could be a later replacement. On the other hand, Fabergé did buy his clock movements from Switzerland and in 1887 Fabergé was still a relatively small operation while Vacheron Constantin was already the oldest and one of the very best manufacturer of watches - the answer to that question may lie in the archives of Vacheron Constantin. Until we know for sure, this egg should be called "Gold Egg with Clock or Watch". We would like to thank Annemiek Wintraecken (for suggesting the availability of the 1887 slot and connecting the mysterious egg in the 1902 picture to the missing 1887 Imperial Fabergé Egg), Jeffrey Eger (for finding and selling us the 1964 Parke Bernet catalog), Kieran McCarthy (for discovering the 1889 Egg and for his insightful questioning), Tatiana Fabergé, Lynette Proler and Valentin Skurlov (for their wonderful 1997 book in which they recognized that missing Imperial Eggs are probably hidden within the pictures of the 1902 Exhibition) and last but not least, we would like to thank Christel McCanless for keeping us all connected, informed and motivated. Following the recent discoveries of the pictures of three missing Fabergé Imperial Eggs, there are only three (out of 52) Fabergé Imperial Eggs left for which we have no pictures or designs (we just have sparse written descriptions). These are the 1886 Hen Egg with Sapphire Pendant, the 1897 Mauve Enamel Egg and the 1902 Empire Nephrite Egg. The hunt goes on! I think Anna and Vincent found an exciting photograph of the 1887 Imperial Easter Egg and that if the Egg sold at auction in 1964 is still "alive and well", someone is going to be a very, very happy person! Post scriptum by AW March 2014: What a happy ending, the Egg being found, looking so well, and hopefully a very happy person in the US Mid West indeed!! Because people ask: As far as I know, a Mrs. Rena Clarke (or estate of Mrs. Rena Clarke) sold the item in 1964. It is not known who bought the Egg in the 1964 auction, nor is it known where the Egg was staying untill it was found again in 2014. See this Egg in a BBC Movie! 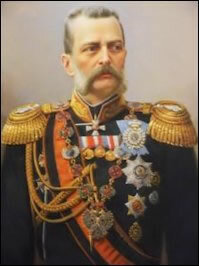 The letter was written on May 4, 1887, by Modest Feopemtovich Solovyev, the Governor of the Office of Grand Duke Vladimir’s Court from 1881 to 1899, to Nikolai Stepanovich Petrov (1833-1913), who in 1887 was the Head of Cabinet of Alexander III ... Grand Duke Vladimir once again helped his brother Alexander III to order an Easter egg - this one for the year 1887. The read the complete article, click here!